Any contract made with Haag-Streit UK Limited (hereinafter called the Company) for the supply of goods, or the rendering of any services shall include the following Standard Conditions and no exclusion, variation or addition shall be valid unless expressly agreed to in writing by the Company. No order shall become binding on the Company until it has been expressly accepted by the Company in writing. No alteration to this contract or any of these conditions shall be binding on the Company unless agreed in writing. Reference numbers shown in catalogues, or price lists, should be quoted to avoid misunderstanding. The voltage and current, whether A.C. or D.C. must be stated when an electrical supply is necessary. Whilst every effort is made to ensure accuracy of statements and illustrations contained in catalogues and price lists, such statements are statements of opinion only and not statements of fact. Unless otherwise specified in the quotation all prices quoted are “net ex works” and are based on current labour and material costs. The customer is therefore liable to pay all charges for transport, packaging and insurance. In the event of any increase in cost of materials, rates of wages, statutory levies or rates of exchange between the date of quotation and the date of despatch, the Company shall be entitled to charge prices in force at the date of despatch without notice. Prices exclude Value Added Tax, which will be applied at the current rate to supplies for United Kingdom destinations. The Company will use its best endeavours to comply with the delivery dates specified in the quotation but shall not be liable for any loss or damage suffered by the Purchaser because of failure from any cause whatsoever to deliver by the due date. Time for delivery shall not be of the essence and any failure to deliver by the due date shall not give the Purchaser the right to rescind the contract. Where circumstances beyond the reasonable control of the Company cause delivery to be impossible or impractical as envisaged by the Contract, the Company will accept no liability for loss or damage resulting. Unless otherwise stated, goods will be despatched carriage paid and insured in transit. The cost of carriage, packing and insurance will be charged to the purchaser. Claims for shortages, or damage in transit, will be considered only if the carrier and the Company are advised in writing within three days of receipt of consignment, retaining the goods and packaging materials for inspection. Claims for loss in transit should be made in writing within twenty-one days from advised date of despatch. The property in the goods sold shall remain with the Company until the Purchaser pays for them (cash or cleared funds) in full and the Purchaser shall have possession of them until payment as the Company’s fiduciary agent and bailee only and shall keep the goods identified as the Company’s property. Risk in the goods sold shall pass to the Purchaser on delivery notwithstanding that ownership will not pass until payment is made in full. The Customer grants an irrevocable licence to the Company and its agents to enter on to the Customer’s premises with vehicles if necessary for the purpose of taking possession of the Company’s property. In the event of any resale by the Customer to a third party of the Company’s goods, the beneficial entitlement of the Company shall attach to any claim against the Customer’s purchaser and to any proceeds of that sale and the Customer shall have a fiduciary duty to account to the Company for the claim and the proceeds. Where proceeds of such a sale are received by the Customer, the Customer shall keep them in a separate account as agent for the Company until the amount due to the Company is paid. Goods may be returned only by prior written consent from the Company. They must be sent carriage paid and insured In transit. If returned from overseas they should be sent by air/surface post and NOT by freight, unless size and weight make it absolutely necessary. All charges and clearance on importation will be for the consignor’s account. The Company reserves the right to charge a reasonable handling charge where this is justified. Orders cannot be cancelled or deliveries postponed except with the consent of the Company and on terms which will indemnify the Company against all loss. United Kingdom – Settlement to be received within 30 days from date of invoice. Overseas – For clients with an account with us – Settlement to be received by the end of the month following month of invoice. For clients who have no account with us, payment to be made by Letter of Credit (see below), Sight Draft or payment prior to despatch. If payment is not received by the due date the Company will be entitled to charge interest on the amount due from that date until the date of payment in full (whether before or after judgement) at 4% over Barclays Bank Base Rate in force for the time being. 1. To be opened through Barclays Bank PLC, UK Trade Services, P.O. Box 340, 1st Floor, 45 Church Street, Birmingham B3 2BZ, U.K. 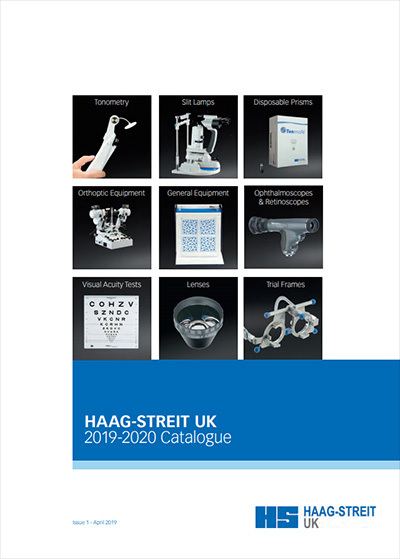 In the name of Haag-Streit UK Limited, and TO BE CONFIRMED AND endorsed “irrevocable” and drawn at “Sight” and “Payable in Birmingham”. 2. The Opener to pay all banking, negotiation and amendment charges. 3. Should reach us in good time to allow for any necessary amendments prior to the date of readiness as specified in our acknowledgement. 4. The latest date for shipment should be at least 2 months beyond the date of readiness as specified in our acknowledgement. 5. The date of expiry should be at least 1 month after the latest date for shipment. 6. The Port of Shipment is to be described as ”UK Port/Airport” and no individual port nominated. Where special tools are required to produce goods as to the Purchaser’s own specifications, any charges made in respect of such tools represent part costs only and all special equipment, tools and dies shall remain the property of the Company. If any contract or any part of it shall be frustrated and be impossible of performance, then the Company shall nonetheless be entitled to a fair proportion of the contract price based upon the work done on the contract up to the date of frustration, provided that an allowance shall be made to the Purchaser for the net proceeds of sale of any goods manufactured by the Company under the contract which are in a saleable state at the date of frustration and are in fact sold within two months of that date. If the goods to be supplied under any contract are to be in accordance with design instructions or specifications supplied by the Purchaser and compliance with such instructions or specifications involves the breach of any Patent right, Registered Design or Trade Mark, then the Purchaser agrees to indemnify the Company against all costs, claims, actions, demands, damages or penalties to which the Company may become liable in respect of any such breach. (i) Subject to due compliance with such operating instructions as may be supplied with its goods and to normal usage, the Company warrants that any equipment or part actually manufactured by the Company will correspond with its specification and be free from defects of material or workmanship for a period of twelve calendar months from the date of despatch and in the event of any such equipment or part being defective, undertakes to replace or repair it free of charge provided that it is returned to the Company Works at Harlow, Essex, (or elsewhere as the Company may direct) carriage and insurance paid by the Purchaser. (ii) If the goods supplied under any contract consist of or include equipment manufactured by any other person or company in respect of which a warranty or guarantee has been given to the Company by the supplier thereof, the Company agrees to assign the benefit of such warranty or guarantee to the Purchaser. (c) has been repaired or serviced by any person or company other than the Company or its approved representatives. The Company shall be entitled to sub-contract any part of the contract. Unless otherwise stated by the Company, under normal conditions of use, products supplied do not include any hazardous substances as defined by EH40 issued by The Health and Safety Executive. (i) Subject as expressly provided in these conditions, and except where the goods are sold to a person dealing as a consumer (within the meaning of the Unfair Contract Terms Act 1977), all warranties, conditions or other terms implied by statute or common law are excluded to the fullest extent permitted by law. (ii) Where the goods are sold under a consumer transaction (as defined by the Consumer Transactions (Restrictions on Statements) Order 1976) the statutory rights of the Purchaser are not affected by these conditions. claims for consequential compensation whatsoever (and whether caused by the negligence of the Company, its employees or agents or otherwise) which arise out of, or in connection with, the supply of the goods or their use or resale by the Purchaser, except as expressly provided in these conditions. The Purchaser shall not be entitled to the benefit of any set-off to which he might be otherwise entitled in law or in equity. All sums payable under this contract will be payable without any deduction and the Company shall be entitled in the event of non-payment to obtain and enforce judgement thereon without any stay of execution pending the determination of any cross claim by the Purchaser. Any contract shall be deemed to be made in England and all questions arising out of such contract shall be governed and decided in accordance with English law. The Company reserves the right to refer any dispute under this contract to arbitration in accordance with the Arbitration Acts 1950 and 1959 with any statutory modifications thereof for the time being in force and the arbitrator shall be appointed by agreement between the parties or in default of agreement, by the Company.